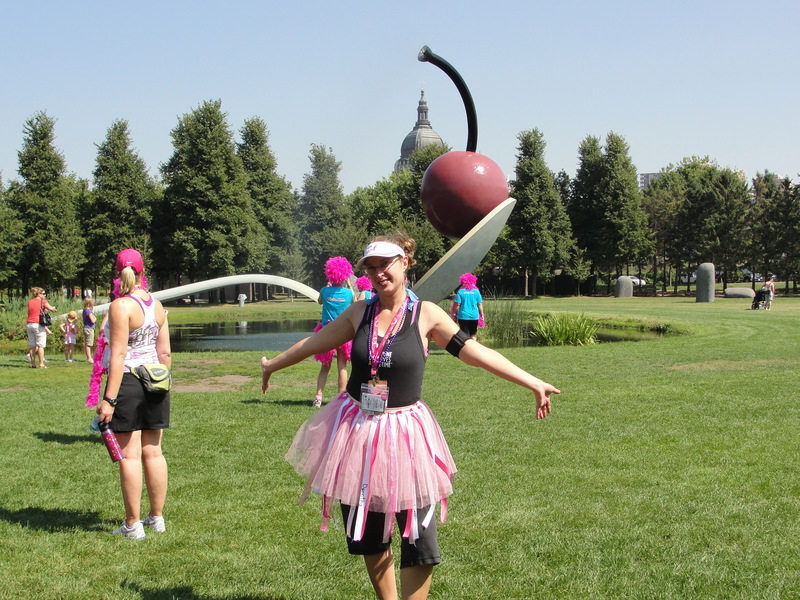 Here I am, in the tutu, in front of the Sculpture Gardens at the Walker Art Center in Minneapolis, MN. This was just before lunch on Day 1. This past weekend was the Susan G. Komen, 3 Day for the Cure. This was my second year in a row walking it. 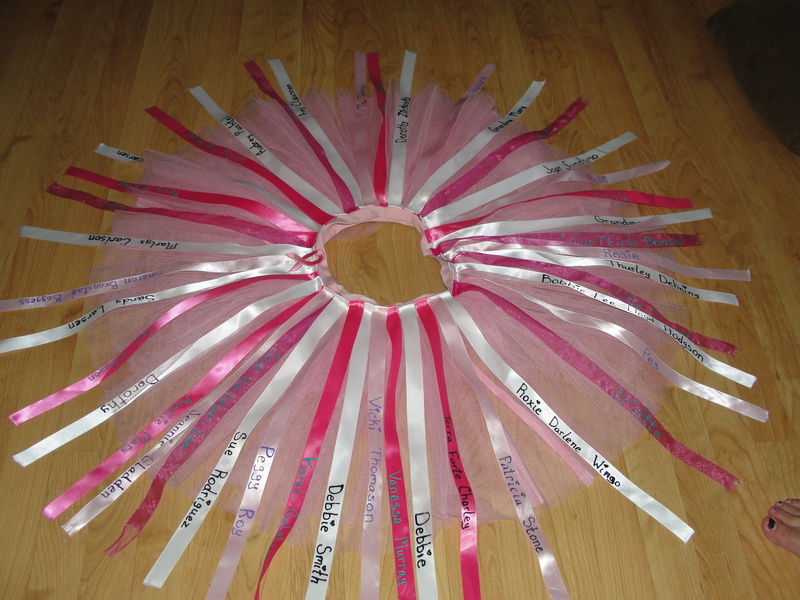 As part of my fundraising, I sold ribbons that I sewed to a tutu. People could purchase white ribbons in memory of someone who lost their battle with breast cancer, or pink ones in honor of a survivor, or someone currently fighting the disease. 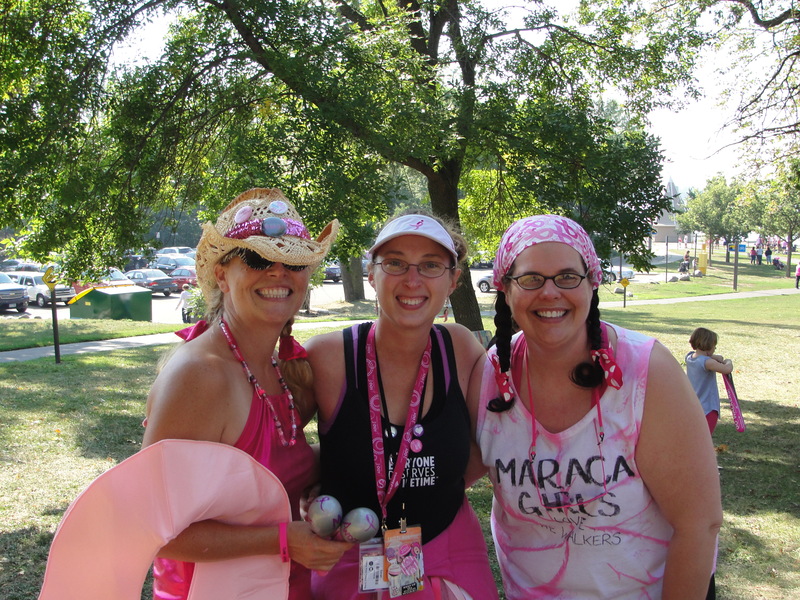 I wore the tutu all three days of the event. It was a blast! *Wearing a tutu on a hot day = extra sweat around the mid-section. *It’s REALLY fun to dance in a tutu!!!! *Your arms swing more than you realize when walking, swishing the tutu and ribbons at your side. Whenever your ring, leaves, grass, or any other random object hits the see-through ribbons, they will fray very easily. No more of those ribbons for my tutu (from now on, I’m sticking with the solid ribbons)! *Stray strings coming off the tutu feel like spider webs to the person walking next to you. *Little girls may ask you to twirl so they can see the tutu and ribbons spin. *When wearing a tutu full of ribbons with names on them, many people will ask what it’s about, and then become sad at how many white ribbons there are. Here I am with @MNHockeyMama. These ladies were fabulous “Walker Stalkers” that I actually met last year, then connected with on twitter, quite by accident. The Maraca Girls are great motivators!! *If you are looking to meet “twitter friends” in person, the ribbon tutu makes it really easy to spot you. Yay for getting to meet @ilovemyminivan and @MNHockeyMama in person! *It’s really fun to dance in a tutu!!! I know I already said it, but it’s pretty much as fun as dancing in a wedding dress. Though, it might have also been due to the fact that last year I couldn’t walk after Day 2, let alone dance, and I was pretty dang excited to be able to dance this year! Here’s my tutu after 3 days of madness. Each of these ribbons represents someone who is fighting, has fought and won, or has fought and lost their battle with breast cancer. *Going to the bathroom in a port-a-potty with a tutu full of ribbons on, sometimes proves a bit challenging. *It was good to have the tent to myself, because the tutu pretty much took up the other side of the tent. I’m sure I will add to this list as I think of more. I will also be posting about each of the 3 days in upcoming posts. Trackback: SQL Saturday #149 – Minnesota « Moments of Brilliance… or Not!